The facelift is a form of cosmetic surgery that can improve the appearance of the face by tightening the skin and smoothing wrinkles caused by aging, sun exposure, smoking, gravity, and stress. Many people who experience these want to regain the youthful appearance of a smooth, wrinkle-free face. This procedure can effectively reduce the appearance of facial aging so that patients can look and feel young and confident. Jeffrey Colyer, M.D. uses advanced techniques and state-of-the-art medical equipment to achieve beautifully customized facelift results with a natural, youthful, refreshed look. During your private consultation with Dr. Colyer, you will go over your medical history, your facial anatomy, and your desires. As you are completely open with Dr. Colyer about your hopes and expectations, he will discuss the possibilities and potential corrections based on your anatomy. Here, Dr. Colyer will carefully examine your skin tone, muscle tone, fat deposits, and facial anatomy to create a customized surgical plan for you. He will also help you to understand where the incisions will be and what you should expect throughout the experience. For patients who desire additional procedures for even greater facial rejuvenation, Dr. Colyer can also perform eyelid surgery, Smartlipo™ on the neck, fractional skin resurfacing, thread lift, and/or rhinoplasty in conjunction with the facelift. Dr. Colyer offers four facelift procedure options: the mini facelift, the mid facelift, laser mid facelift, and the full facelift and neck lift. Dr. Colyer performs the mini facelift in-office with the patient under local anesthesia. This procedure can enhance the cheeks and reduce minimal loose skin, especially in the lower face. Mini facelift surgery can last anywhere from one to four hours. As Dr. Colyer makes minimal incisions to tighten the muscles and skin, he creates a smoother, younger-looking face shape. As always, the exact details are uniquely customized for each patient. The best candidates for a mini facelift are in their 30s or 40s and are just beginning to show signs of aging. Additional good candidates are those who have previously had a full facelift and are once again seeing signs of sagging skin and wrinkles. Dr. Colyer performs the mid facelift at the hospital with the patient under general anesthesia. Here, the focus is lifting the triangular area between the corners of the mouth and the corners of the eyes. The doctor will make tiny incisions to reposition the skin, fat, and muscle tissues in the middle part of the face. This process lifts the face so that it looks fuller, firmer, and more youthful. In some cases, the mid facelift can also improve the neck. Dr. Colyer performs the mid face laser facelift in-office with the patient under local anesthesia. The Smart Laser heats the skin from underneath, providing maximum tightening of the tissue. 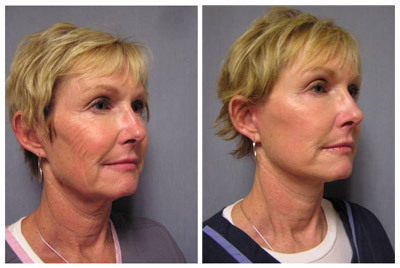 This procedure treats the lower one third of the face, jowl line, and neck. It also lifts the triangular area between the corners of the mouth. Dr. Colyer performs the full facelift and neck lift at the hospital with the patient under general anesthesia. This procedure typically lasts four to five hours and is more complex than the previous options. The doctor will make inconspicuous incisions in front of the ears that extend upward into the hairline and then downward behind the ear so that they are mostly hidden. Occasionally, he also makes an incision underneath the chin. He will then tighten the facial muscles, remove excess fat and sagging skin, and significantly undermine and elevate the deeper facial muscles, fat, and skin. Patients who have extensive facial sagging and wrinkles are most likely to need a full facelift and neck lift. Facelift recovery varies from patient to patient depending on the details of the procedure. Patients may be able to return to work within three to ten days depending on how their faces heal. The swelling will subside within a few days, and most swelling and bruising will be gone within two weeks. For the first few days after surgery, keep your head elevated as much as possible to reduce swelling. As all goes well with your recovery, Dr. Colyer will see you again in seven to ten days after the procedure, at which point he will usually remove the sutures. It will be necessary for you to wear a chin strap for about three weeks. Board-certified facial plastic surgeon Jeffrey Colyer, M.D. can improve the look of your face by restoring your youthful appearance. Schedule your free consultation with him today online or by calling (913) 338-5600.